There’s nothing playful about safe and effective prescribed burning. Too many things can go wrong to take it lightly. Sometimes, I think people see prescribed fire as something that needs to be done to maintain prairies, but they can’t necessarily point to specific objectives for a particular fire. Nor can they describe what kind of burning (season, intensity, size, ignition pattern) is needed to achieve those objectives. Falling into the trap of burning because it seems like the right thing to do leads to two big risks. First, there’s a good chance that the fires will not be conducted in a way (or at the right time of year) that do much good – and could even be counterproductive. Second, because prescribed fire can be a hazardous activity, conducting one without clearly defined reasons means taking big risks for no good reason. A prescribed fire we conducted last week. This one went off without a hitch. Most of them do. We’ve completed two prescribed fires so far this spring. As always, we spend way more time planning our fires than implementing them. That planning starts with setting clear ecological objectives (defining why we’re burning in the first place) which dictate the location, size, season, and even the tactics used during the fire. Once we know what we’re aiming for, we write a burn plan that can help us achieve that in the safest way possible. Our plans detail the kinds of weather conditions and tactics needed to be successful, but also spend a lot of time on contingencies. What will we do if the fire gets away? What does the surrounding landscape offer in terms of safe areas and threats in the case of an escaped fire. How will we respond if someone gets hurt? For me, writing a good burn plan means thinking through all the worst case scenarios. There’s nothing fun about it. Unfortunately, even after all that planning, things still go wrong. Last spring, I wrote about a burn we did in which we ran into repeated equipment issues, and had to shut down for a while until we could get re-equipped and complete the burn. In another fire last year, I overestimated the strength of our blackline containing the fire, and the wind-driven head fire jumped it in one place, forcing us to quickly chase it down. This spring, our first prescribed burn started out well, but the wind came up sooner than had been forecast, and we shut the fire down because a Red Flag Warning was issued. In all of those cases, there were no serious repercussions, and our training and planning helped us deal effectively with unexpected circumstances. Because we’d planned for each contingency, everyone knew how to react when the time came. No property was damaged and no one got hurt. The threat of injury is what makes prescribed fire especially stressful for me. Between potential equipment mishaps and quickly-changing weather and fire conditions, there are numerous opportunities for someone to get hurt. So far, I’ve never had anyone get injured on a fire I’ve been a part of, but that fortunate record certainly isn’t making me complacent. As if I needed a reminder of the danger, one of our crew was helping a partner organization with a fire last week and suffered some slight burns on his neck and face while trying to extinguish a drip torch. After trying and failing to smother the flame at the tip of the torch with a gloved hand (per protocol) the crew member then tried to blow the flame out, and some of the burning torch fuel splattered onto the cotton bandana around his neck. Before he could get the bandana off of his head, he suffered small burns in several places. After a quick trip to a nearby medical clinic, he was fine – though he had to shave off the remainder of his singed beard. It appears there were several things that contributed to the torch incident, possibly including some issues with the torch itself that caused excessive fuel to build up in the torch’s tip, making it particularly difficult to extinguish. After the fire was wrapped up there was considerable discussion about what happened, and hopefully we all learned some things that will make us all safer in the future. Regardless of the cause, however, the aspect of the event that struck me the most was that our crew member was injured doing something he had done hundreds of times before. It’s sobering to know that something as mundane as extinguishing a torch led to injury, and that it could have been much worse than it was. I am a strong and vocal advocate for the use of prescribed fire to manage both private and public lands. On the other hand, prescribed burning is not a sport, it’s a tool, and it’s a tool that we should employ strategically – not for fun, or without specific objectives in mind. If someone can’t clearly explain what they’re trying to achieve by conducting a particular burn, I don’t know how they can justify taking the risk of dropping a match. In addition, if some doesn’t have a clear and detailed plan for how to ignite and contain a fire, and how to respond when things go wrong, I don’t think they have any business lighting that fire in the first place. I know people that really enjoy conducting prescribed fires. Frankly, those people make me nervous, especially if they’re in charge. I don’t dislike prescribed burning, and I get a feeling of satisfaction whenever we wrap one up successfully – especially because I can appreciate the ecological benefits of doing so. But while there is active fire on the ground, there’s a knot in my stomach, and that knot subsides slowly, even after the last of the smoke has faded into the sky. 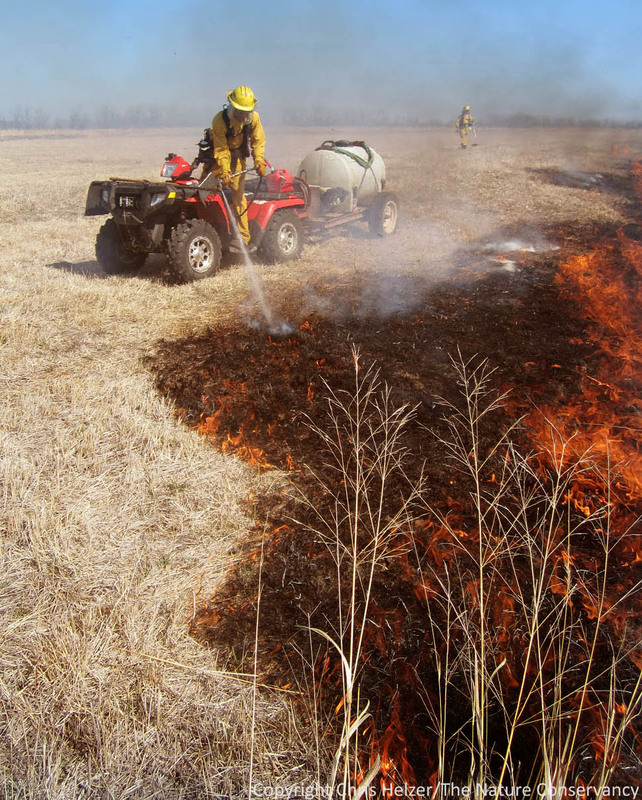 It’s fantastic that the use of prescribed fire is growing among prairie landowners and land managers. More importantly, the greatly increased availability of training and equipment means that we’re not only burning more acres, but we’re also more sophisticated – and hopefully safer – as we do so. However, things will still go wrong. Property will be damaged and people will get hurt. It can happen during even the simplest fires. That doesn’t mean we shouldn’t burn. It does, however, mean that we should burn only when it can be done safely and only when we can burn in ways that achieve important objectives. Otherwise, the risk can quickly outweigh the rewards. The importance of equipment redundancy in prescribed fire. Why prescribed fire doesn’t contribute to global warming. 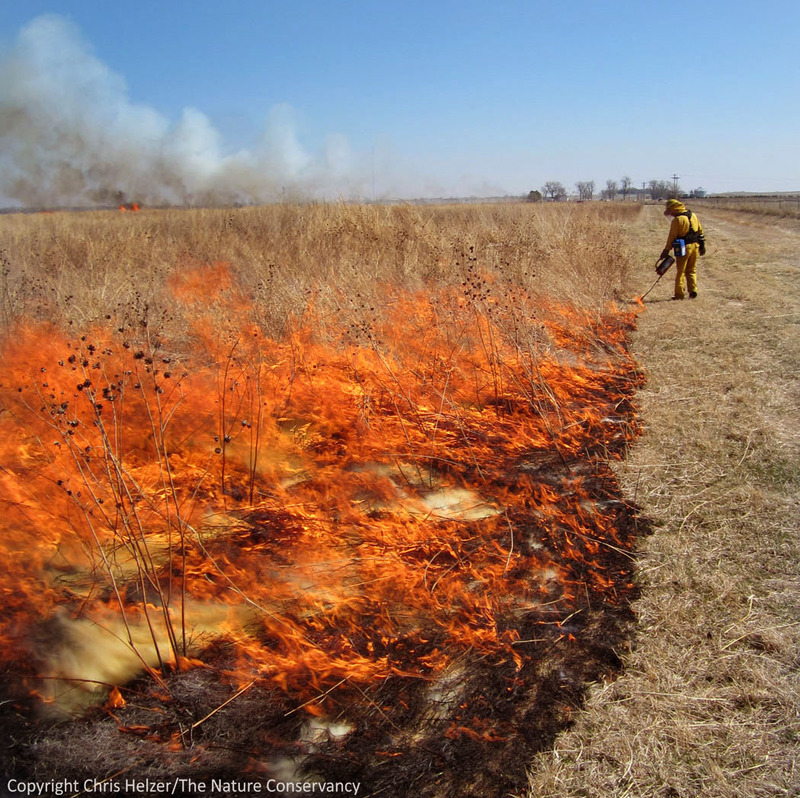 This entry was posted in General, Prairie Management, Prairie Photography and tagged bandana, burning, caution, controlled burn, drip torch, hazards, injury, objectives, prescribed burn, prescribed fire, risk, safety by Chris Helzer. Bookmark the permalink. Great post Chris. I absolutely agree. We’ve managed to complete 7 of 11 “priority fires” for our research this spring so far – my stomach was in knots on every one, despite hours planning each fire overwinter! Dave Engle’s words always ring in my ear: “if you’re not nervous when fire is on the ground, something’s wrong”. I hope your crew member is OK. Good luck with your remaining fire operations – be safe. Nice post Chris! The only thing I might add is that experience is a big key to putting on a successful fire. You may use training interchangeably there but I would emphasize that even with a lot of fire training, the experience I’ve had on the fire line is what has given me the most tools to put together a good fire. I think training is a good thing if done well but it can’t substitute for time spent on a burn, watching and learning how fire works on the landscape. PS: Thanks for the reminder of the right way to put out a torch. I hope your crew member is okay! I have been looking for research that carefully compares conservation grazing alone vs grazing/fire combo. My access to academic literature is spotty, and I am happy to learn of citations for relevant publcations. I have found very few . I am struck that many paleo ecologists (David Burney, for one) report burning, as indicated by micro fossils of carbon, appears simultaneously with people all around the globe. Inferring that before people reached N America Austrailia, etc, there was little burning and much grazing. Indeed, it is hard to imagine heavy fuel loads with all the diverse grazers and browsers present during the ice ages. See also work by Guy Robinson and others on use of fossil fungal spores to estimate previous populations of big animals. So why isn’t there more management by grazing, rather than burning? Why not use a variety of native species (bison, elk, prairie dogs, deer, antelope, etc)? And in some situations perhaps natives could be augmented by exotic species closely related to extinct fauna (horses, Indian elephants). I think there could be reasons not to manage this way, but I do not see evidence that careful studies have been done to compare these different techniques. I hope I have just not done enough lit review, and these studies have already been done. Given the hazards mentioned regarding burning, why are we not doing more to look at alternatives? It’s a good question, and complicated. You might start your literature search with Sam Fuhlendorf’s web page, including some of his recent publications http://nrem.okstate.edu/faculty/fuhlendorf.htm. Sam and Dave Engle champion the position that the combination of prescribed fire and grazing is important – more so than either mgt tool by themselves. They make a compelling case, I think. I’m not sure this will answer your question completely, because you’re really asking about how important grazing (or browsing) is to prairie communities. I think it’s very important, and there is considerable research on grazing, but most is production oriented, rather than focused on conservation objectives. We’re still learning about how prairie communities respond to – and interact with – grazing and browsing. There is some research on the importance of herbivory on prairies (see Henry Howe’s work on small mammal herbivory for example) and some on bison grazing and prairie dog impacts. Probably others I’m not aware of. One issue with grazing is that it can be difficult to use in smaller sites because of the logistics and infrastructure required. By small, I mean maybe 40 acres or less. Also, there is great discomfort with grazing among many eastern tallgrass prairie naturalists in the U.S. Much of that is unfamiliarity with conservation grazing, or even moderate production grazing, and lots of exposure to chronic overgrazing. I don’t think, however, that you can dismiss the importance of fire in prairies just because much of it was done by people. In central North American prairies, for example, people have been present as long as prairies have been (since the last ice age). The fires that prairie communities adapted to were set both by humans and lightning, but both were very important – and caused a cascade of impacts (including intensive grazing) that shaped prairie plant and animal communities. I don’t think you can separate fires from prairies, or fires from people. It’s all wrapped up together. That doesn’t mean you can’t manage for diverse and healthy prairies without fire – but I think there are elements that would be difficult to manipulate/conserve without fire involved. This is very timely and pertinent for me. I just participated in my first and second prescribed fires last week and even though both had very good outcomes of a nice safe burn without any mishaps or injuries – what made me the most nervous was not the behavior of the fire – but rather the behavior of the humans! Not that anyone did anything that I would recognize as unsafe … it’s just that we humans do vary in how we act and react to situations, and tend also to have different opinions on (for example) how to put out a drip torch! I did hear advice given from several different experienced ‘burners’ to put out a drip torch by cupping it from the side with a leather-gloved hand, to just blow it out, to blow it out but from the side, not face-on … etc. But despite those varied instructions – what I found very reassuring is that everyone on both burns clearly understands and defers to the assigned Burn Boss. I really think that selection of the burn boss may be THE most important decision on any burn. I was really impressed with the knowledge, leadership and attitude of the two different burn bosses I worked with. Kudos to everyone who shoulders that role and takes on the responsibility of helping to keep all of us safe when burning (prairies!). Another great and honest post, Chris. The knot in the stomach is a reality for any fire leader – only someone with no responsibilities on a fire think it’s somehow ‘fun’. And I sympathize with the crew member burned while putting out a torch – I’ve come close a few times when the mix was too hot and just wouldn’t go out with leather glove alone. I do recall something Paula Seamon used to say – why clothe yourself in fire resistant clothes and then put an all cotton bandanna around your neck? I don’t like having something flammable close to my face. If you really want some kind of face cover, you can make a fire-resistant bandanna from old nomex shirts. I’ve seen guys wear face and neck protectors. These seem to work well. They also help keep hot coals from running down your back. I like to wear a simple dust mask. I know the smoke particle size is too small to be filtered by the dust mask. The benefit is the mask helps keep your nasal passages moist. I have found that when your nasal passages are moist they are much better at trapping the smoke particles thereby keeping them out of your lungs. You should not be nervous just because someone likes to conduct prescribed fires. I have seen burn bosses that are too cautious when making decisions regarding burning. The result of an overly cautious burn boss is ecological goals are not achieved even when risks are appropriate. In contrast, the best burn boss I know calls prescribed fires “fun” and he often says “I can’t believe I get paid to do this.” I think his positive attitude really helps keep the morale high of the guys who burn with him. He enjoys conducting prescribed fires, while also always making the best calls regarding the safety of the general public and his crew. This is the kind of guy you want running your burn program or leading a team. Fire is fascinating. And fire leaders that still enjoy the beauty of mystery of looking into flames should not worry you. Their competence on the line or not should be your concern. My concern is burn bosses that are too nervous and wait for exacting conditions to achieve a particular effect with a fire, when any critical analysis of fire in the Midwest would show that under use of fire as a land management tool is the far greater threat to natural areas than cavalier burn bosses. Gus – it’s a good point, and I agree. I don’t worry about burn bosses that appreciate fire – in fact, an appreciation probably correlates with understanding, which helps make them safer. You’re right, it’s the competence that’s important. I think my fear is that I’m meeting people who rhapsodize about how much fun it is to burn, but don’t really have much experience, and are burning without taking the planning and equipment safeguards needed to be safe. And, of course, the other point of the blog post was that even with experienced and competent burn bosses, things can go wrong, so we shouldn’t be burning unless we have a specific and clear need. Thanks for the comment. Keep ’em coming. The issue for natural areas in Illinois and Indiana is way too few fires, full stop. The lack of fire is far more detrimental in the long run than any fire, that stays in the burn unit. Unless major changes start occurring in land management which will need to be lead by federal, state, county and/ or not for profit organizations, to show the way to managing healthy systems we will end up with a few preserves with the last remnants of formerly widespread species being isolated to tiny remnants and now called a conservative species in a see of ecological junk. “Showing the way” means safe burning for sure but also not making it out to be rocket science, which it isn’t and helping to make it easier for people to get access to relevant equipment, training and experience in implementing fire. Torch problems are often related to maintnance of the fine screens that when blocked, do not allow fuel to flow properly. I had a crew member get sprayed with fuel mix in his face when he set the torch on the ground. Heat caused pressure to build in the torch, a small orifice was plugged which did not allow the torch to “breathe” resulting in a close call with very minor burns thanks to ppe. I’ve always wondered why people conducting prescribed burns do not tie together a bundle of sticks, light it, and drag it. This could not be much heavier than a torch. With fuel prices, it may soon be cost effective too. James – one disadvantage is that when you want to stop lighting a line it’s hard to put your bundle of sticks out and then relight it when you want to continue lighting the line… There’s a lot of stopping and starting, when we burn anyway, so the water sprayer can catch up with the igniter and so we can re-check the line behind us. quickly, while waiting for the guys behind you to extinguish the fire. In the Chicago Region, most areas are surrounded by mowed trails. Breaks are usually only made to divide up a larger area. Most fire laid with a torch is not used to make breaks, but to light a new strip. In the situation where you already have breaks and are merely lighting strips, the stopping and restarting issue is not such a big concern.